It might seem a little strange to be posting a roast pork recipe just as we are a month out from Summer in Australia. But pork is a most versatile meat and one that is great to eat all year round. It is lean, fresh and healthy and lends itself to a lot of interpretation. Also, I am determined to get in another couple of roasting attempts before it becomes BBQ season, and pork felt like a great springtime meat. I’m delighted to announce that Chew Town has teamed up with Murray Valley Pork to bring Chew Town readers some great new pork recipes to add to your entertaining arsenal. With a fridge full of the most amazing pork, this Blackened Maple and Blood Orange Roast Pork is the start of some great easy pork recipes for you to try at home to impress family and friends. Murray Valley Pork is Australian grown in the Riverina region of Southern NSW and Northern VIC. It is grown across a network of farms that produces extremely high quality pork products sold exclusively by butchers throughout Australia (here is a list of butchers stocking Murray Valley Pork) . The quality of this pork was evident from the moment it arrived and it will be just as good when you buy it from your local butcher. It reminded me of a conversation I had with my father, Dante, when I moved interstate over 11 years ago: “Amanda, no matter what happens when you are on your own, always make sure you have enough money left to buy great quality fresh produce”. You see, Dante knew that I had a love of shoes and handbags and his smart words have stuck with me since that very day. He would definitely approve of the quality and freshness of this pork! Because of the versatility of Pork there are many different cuts available and different cooking times for each cut, so as this is the first of my Murray Valley Pork posts let’s start by demystifying the cuts of meat available with Chew Town’s guide to pork cuts below. This Blackened Maple and Blood Orange Roast Pork is the ultimate easy and impressive roast. It requires little effort on your end with a throw together overnight marinade, 80 minutes in the oven and dutch carrots cooked in the roast’s marinade. 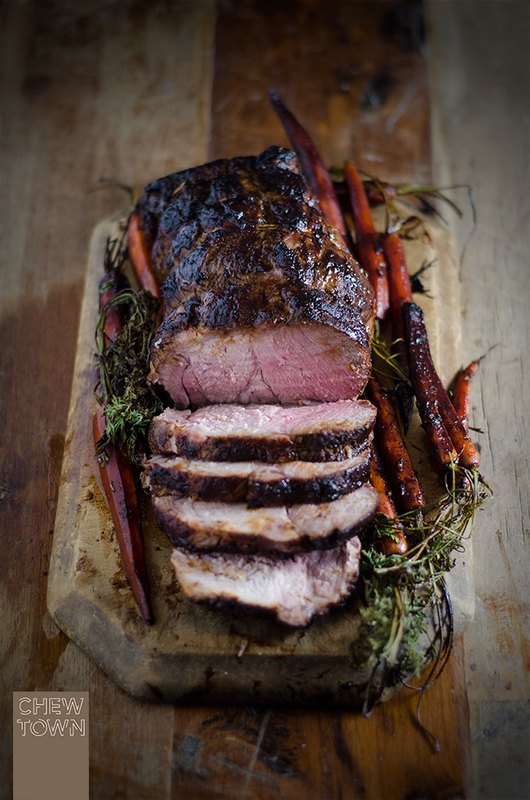 You will be rewarded at first carve with wonderfully fragrant and succulent pork. If you have any leftovers, the pork tastes spectacular served cold and sliced thinly for lunch the next day. Pat the pork dry with paper towel then season with salt and pepper. Combine maple syrup, soy sauce, ginger, garlic and blood orange rind in a shallow dish and add pork, turning to coat the meat. Cover and refrigerate overnight turning occasionally. Place orange segments in the centre of a baking dish. Remove the pork from the marinade and place on top of the orange segments so that the base of the pork is resting on the segments and not on the base of the dish. Pour marinade into the bottom of the baking dish and add the blood orange juice to it. 20 minutes before the end of the cooking time, add 1/2 cup water to the base of the pan and then the carrots to the marinade mixture. Once desired temperature has been reached. Remove the roast from the oven and rest covered in aluminium foil for 10 minutes for the juices to evenly distribute throughout the meat before serving. *NB: Pork today is very lean and shouldn’t be overcooked. It is always best to check doneness of roast pork with a digital cooking thermometer. 62° Celsius is recommended for cooking roasts, tenderloins and chops. When using a thermometer, ensure that it is inserted into the middle of the thickest portion of the meat. Chew Town would like to thank Murray Valley Pork for the great pork product provided for the development of this recipe. Yum, I can just about taste this glorious hunk of swine. Loving the flavours you’ve got going here, Amanda! Maravilloso, apetitoso y una fotografía espectacular. Enhorabuena! now that’s what you call a roast. It looks absolutely stunning, and can picture everyone getting excited to dig in! i have never had much luck with roasting pork, i must take on this recipe, will not give up roasting pork till i succeed! Recent Post: Jackie M’s- restaurant + Night Noodle Markets 2013. This is the perfect recipe for your friends in the Northern Hemisphere. 😉 We can appreciate it. I made a pork roast earlier this week, although it didn’t look as wonderful as yours. Good stuff – thanks. That looks awesome and would be perfect for Christmas! Beautiful char!! Get some pork on your fork! I really can’t shake that advertising jingle from the 80’s. What a stunning looking pork roast. Love the flavours, and I think that it would be perfect for a Christmas roast as well. Oh and, love you piggie cuts diagram, very cute. Recent Post: Who Won Recipe to Riches Australia Season 1? I’m not the biggest pork fan mainly because when I worked with live pigs at Uni …they were so intelligent! It sometimes makes me feel guilty eating them. This dish is enough to turn me though, that blackened crackling!!! Drooool! I’m not the biggest fan of pork, but this looks and sounds amazing! One to bookmark for christmas inspiration I think – much more interesting than a traditional pork roast! I made a pork roast earlier this week, although it didn’t look as wonderful as yours. Good stuff – thanks for sharing !! !